Who wouldn’t want to turn their refrigerator in Pepperland? 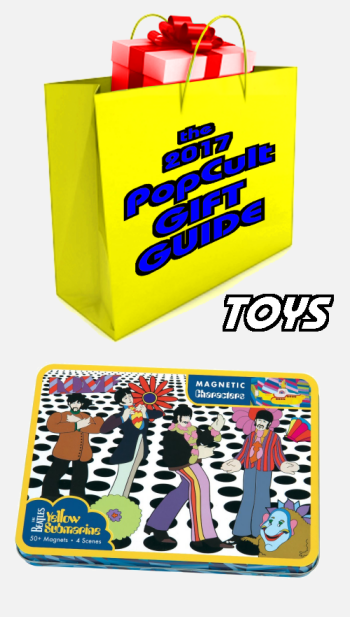 Our next pick in the 2017 PopCult Gift Guide, wrapping up our second day devoted to The Beatles, is a cool set of magnets featuring Heinz Edelmann’s animated designs from The Beatles’ Yellow Submarine. This is a great gift for anybody of any age who loves the Beatles’ animated classic. Mudpuppy, the cool magnet people, have created a fantastic set that lets you relive the movie, and make your own further adventures with the Fab Four and their Pepperland Dopplegangers. Join The Beatles and Old Fred on an imaginative adventure with The Beatles Yellow Submarine Magnetic Character Set from Mudpuppy. Perfect for fun at home or while traveling, three sheets of shaped magnets and four illustrated background scenes, feature iconic characters and images from the 1968 classic film Yellow Submarine. Magnets stick to the hinged tin packaging, so there are no lost parts! Or you can free the magnets from their tinny imprisonment and allow them roam free on any metal surfaces in your home, be they the refrigerator, dishwasher, dryer or the steel plate in grandpa’s head. You get three sheets of magnets, four illustrated background scenes and a tin package that can help you contain all the magnetism. The tin box is hinged and measures almost nine inches by six and a half inches, and it’s an inch deep. Recommended for ages 3 and up. You may luck out and find this set in a cool magnet store of some sort, but your best bet is to go to Amazon.